Welcome to Muddaritaville Studio: It's a White Christmas this Year! We've gone White this year! We wanted a smaller tree that would fit on a corner table in the Living Room, with all the painting and decor changes we are making right now we thought a white tree would look really great. The room is a bit of a mess, Frank is working on the faux brick and I still have to finish off the kitchen so I will post a shot later to give the whole effect of the tree in the room. Here's a close up. Hmmm, I better go back and read Donna at Funky Junks Photo tutorial. Can you believe I work at a Photo Studio? No I don't take the pictures, that's evident in my photos. 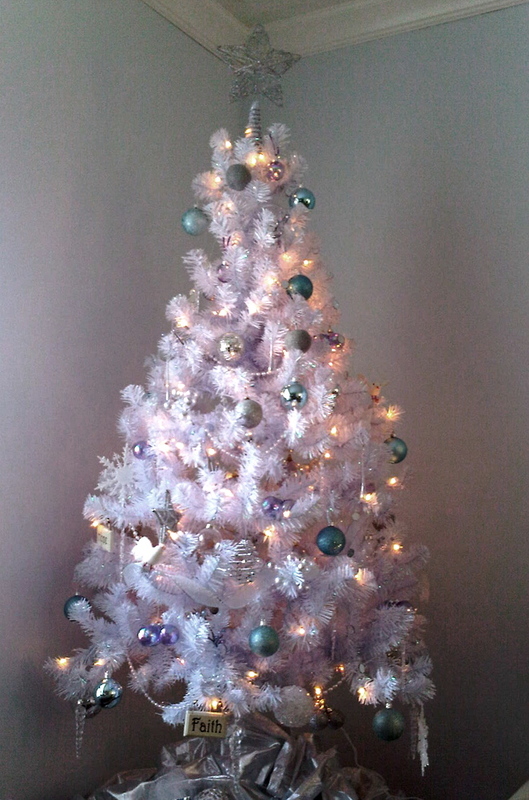 I'm happy with the tree but I think it will need some tweaking next year, I may have rushed the decorating a little. As Frank says the tree's hips are out of alignment, I didn't do a very good job of "fluffing" the tree before decorating. I'm linking to the Holiday Home Party at Thrifty Decor Chick! That is a very good pic the blackberry took! Love your tree! 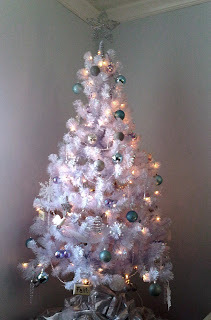 Love your white tree--I really like the tree topper!